Less than 1 percent of the U.S. population has volunteered to serve in the recent wars in Iraq and Afghanistan. Thanks in part to a small but firmly rooted ROTC program at the College, at least 48 Dartmouth alumni are among them. Jon Kuniholm ’93 is working on an advancement that could alter the lives of many veterans—including his own. 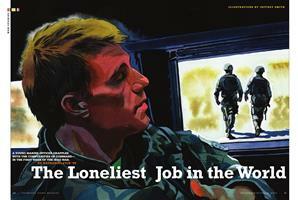 A young Marine officer grapples with the complexities of command—in the first week of the Iraq War. Kyle Teamey ’98 helped write the book—literally—on counterinsurgency for the U.S. Army. Sometimes doing one’s job in a war zone means shutting down emotions. Then comes the delayed reaction. 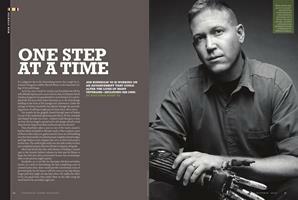 Six alumni veterans settle into a new sense of normal in their post-military lives. 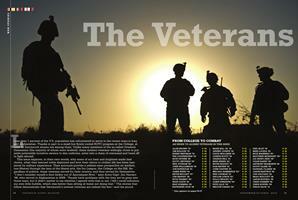 A briefing on the service and college careers of Dartmouth’s 21st-century alumni veterans. A former Army doctor laments the wounded and their forever-damaged families.